The first three months of the new financial year have been fulfilling for PCTE and we cannot wait to update you on some of the exciting news. With an aim to further assist our customers in the West we have formalised the Perth office with dedicated sales staff, our MD Reuben Barnes. In NSW, we exhibited at the Australasian Tunnelling Society conference and received an impressive industry reaction. We have a quick overview of the event on our website here. In addition, PCTE welcomes Larry Olson, the world renowned expert in Non-destructive evaluation of civil structures. He will be attending our special cocktail event in Sydney on the 15th of Oct.
As more and more quality assurance specifications require concrete cover checks nowadays, we will give you an comprehensive overview of how to carry them out properly. Lastly, we will present an extract from our Australasian Tunnelling Society Conference paper on Geotechnical instrumentation of tunnels. Completing a cover survey for quality assurance of new structures is more than just checking cover in random locations, though depending upon the purpose of the survey that is an important part of the process. This article will discuss the process from system selection through to reporting, providing advice at each. The most common equipment used for cover surveys are magnetic cover meters and ground penetrating radar. There are also rare occasions in which ultrasonic imaging equipment may be suitable, but it is generally not appropriate. Pulse induction cover meters are accurate to within 1mm within their shortest scanning range, older magnetic reluctance systems are essentially obsolete having lower precision and a greater tendency to drift from a zero value. The greatest range to which a cover meter is suitable is generally 140 mm for a structure with 16 mm diameter reinforcing bars (although maximum depth of penetration is as much a function of depth as it is of bar spacings). Ground penetrating radar [GPR] does not have as tight an accuracy range, with measurements usually being within 10 mm depending upon operator skill and calibration for the on-site materials. GPR is typically only used for cover measurements where a structures reinforcing cage is very congested or as a secondary result of surveys for reinforcing layout of complicated structures. 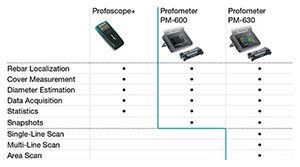 PCTE's new ProfoMeter PM600 and the well-established ProfoScope are compliant with all international standards of accuracy. Both models can be delivered with data logging capabilities allowing the data to be collected and transferred onto computer for the appropriate statistical treatment. The new ProfoMeter PM600 also contains the above DBV guidelines as an automatic data treatment on the control unit. PCTE can also advise you on the most appropriate method to carry out your survey and the pros and cons of any of our testing systems for the job. When conducting quality assurance checks on new structures the choice is between doing a complete survey or to reduce the scope of the survey. For pre-cast elements with tight control it may be possible to check key points on the reinforcing cage and confirm compliance for every element, but for in-situ construction surveying complete pours is impractical. The alternative is to treat the cover of all similar elements together as a normal statistical population then determine the number of points which need to be surveyed to provide a suitable level of confidence that the whole structure is compliant. For example the precast beams may be one population and the cast insitu columns may be another. It may be necessary to further break down populations, such as when average cover at the base of a wall may be more consistent where the bars are tied into the structure. Near the top where they are free and retained by bar spacers only there may be greater variance or a trend to low or high cover. Then the overall size of the population must be estimated, number of bars per square meter and overall surface area will suffice. Finally armed with information on each population the number of random tests to conduct can be calculated. ASTM E 122 offers one procedure with helpful commentary. As an alternative to calculating sample sizes manually there may be specifications that indicate the minimum expected testing requirements. 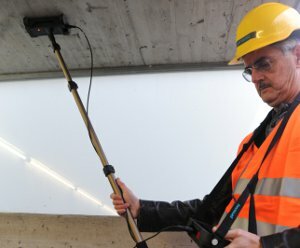 For example the Vic Roads Section 610.33, which states that for new construction every 25m2 area of concrete a 3m2 sampling region must have 10 measurements recorded using a calibrated cover meter. Detailed guidance can be found within the DBV Guide to Good Practice "Concrete Clear Cover and Reinforcement" (Edition 2002) which provides clear and concise methodology for the treatment of results (we can provide a link to a summary of this in English for interested customers). The upcoming Z7-07 from the Concrete Institute of Australia also has guidance with regards to cover measurements on new structures. When working on site the survey can hopefully be completed as planned. If the real environment is very different to that discussed during the planning stages then it be necessary to change the scope of the job or replan. Some general "gotchas" that may be found on site. With cover meters or GPR they can only detect reinforcing directly beneath the sensor, where angles and fixtures prevent scanning it may be necessary to make qualified assumptions based upon surrounding rebar layout, these must always be clearly stated in reports. For magnetic cover meters any metal close to the point of scanning will decrease the apparent cover measurement. Metallic coatings or steel fibre reinforcing will completely prevent scanning with radar or cover meter. Where checks are small scale it may be sufficient to train the operator make final decisions on compliance and approve the elements directly, such as with cover checks upon receipt of pre cast panels. Larger surveys will require at least data retention to confirm compliance and in some cases a formal report. A proforma should be used on site when data is being recorded manually, and even with automatic data logging notes should be taken which relate file names to survey locations as a bare minimum. A report should clearly indicate the region surveyed, if it is compliant or non-compliant, and then collected data and calculations for review if necessary. It should also clearly indicate which standards and specifications were used along with calibration information for test systems. This chapter looks to give a brief description of types of sensors available as well as some commentary on how they are used and the practicalities of such sensors. Vibrating wire (VW) strain gauges are designed to measure the effect of loads, settlement or other changes in a structure, such as the loading of post tension cables or removal of temporary supports. Construction or repair works in tunnels often requires the measurement of strains at critical locations. They record strain, a dimensionless measure of deformation. Stress is related to strain by a material’s properties and is predictable within a certain range of applied strain. VW strain gauge operates on the principle that a tensioned wire when plucked vibrates at its resonant frequency. 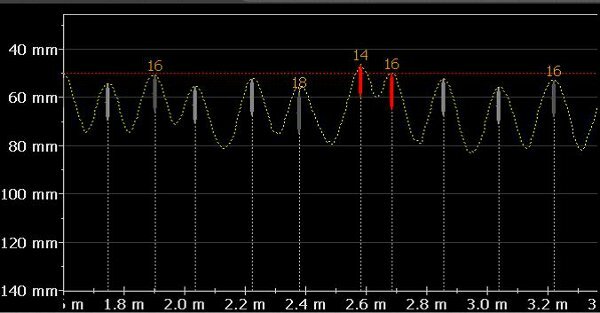 The change in frequency is proportional to change in strain in the wire. The gauge consists of two end blocks with a tensioned steel wire between them. The end blocks can be attached by either arc welding, bonding or groutable anchors to steel or concrete structures. Around the wire is a magnetic coil which when an excitation voltage is applied pluck the wire and measures the resultant resonant frequency of vibration. Deformation within the steel or concrete will cause the two end blocks to move relative to each other and tension in the wire between the blocks will change accordingly, thus altering the resonant frequency of the wire. Temperature information is used to correct for different thermal expansion rates of dissimilar materials and if logging regularly can also determine swift temperature changes during which strain readings may be exaggerated. Fibre optic strain gauges are widely used in harsh environment such as tunnels or permanent monitoring due to advantages over conventional electrical systems and their durability. A fibre optical strain gauge does not use electrical conductors and is therefore completely immune to electromagnetic interference. This is a critical advantage when strain monitoring is required in locations close to EM such as electric motors, antennas, etc. Whilst working in harsh environments this type of sensor potentially reduces the long-term maintenance costs of the system due to its immunity to lightning and resistance to metallic corrosion (Kim 2011). For applications over large physical areas, the cabling maintenance and installation of a distributed fibre optic strain gauge system is substantially reduced by running the entire system on a single optic fibre. Tilt-meters are used to monitor changes in the inclination at a point, they measure rotation. Generally they are useful for monitoring structural elements whose settlement or failure will involve a rotation component, such as a retaining walls. They can also be used for deflection measurement, but only when the deflection will move about another point, and then deflection is measured relative to that point. Tilt beams are an application of tilt sensors that can be used to measure relative deflection in tunnels. A MEMS tilt sensors is housed inside of a long fibre-glass or metal beam, able to rotate about fixing points at either end. A single beam will show deflection between two points. If multiple beams are arranged in series then a detailed record of the differential displacement ofthe tunnel can be recorded. Figure 1 shows the relationship between tilt angle and deflection of a single beam, and how a displacement profile can be collected from tilt beams after installation, please note all motion shown in the Diagram is heavily exaggerated. Robotic total stations have been very successful in supplementing or replacing convergence and displacement measurements. Once set up they can measure to prisms in line of site with high accuracy. They are a particularly good choice for monitoring existing structures close to construction. A station distant enough from the construction site to be unaffected by local movements can still pick up prisms mounted on surrounding buildings or on settlement points (Walker 2006, pg. 10). They can also be used at critical points in existing tunnels that are at risk from nearby construction. The cost of the stations and time spent on adjustment makes them less suitable for use at the face of a tunnel as the additional set-up work for the monitoring team to relocate as construction continues is a clear constraint on progress of the works. Extensometer are typically used to monitor settlement and deformation in soil and rock. Tunnelling, construction of foundations, excavations and embankments often require extensometer. They allow settlement to be identified at the depth/position where the settlement has occurred, as well as measuring the total amount of settlement. In tunnelling applications extensometers are often used to monitor the deflection of the tunnel relative to the surround earth. Linked arrays of extensometers are also used about the perimeter of tunnels for automated systems. Modern extensometers normally comprise a reference head and one or more anchors, each of which is placed at a known depth and connected to the reference head. As the structure under test deforms the anchors’ positions change and the relative movement can be measured at the reference head with automated sensors, or manually. Depending upon the monitoring sensor selected, and the frequency which it is read; the magnitude, distribution, rate and acceleration of deformation can be accurately measured at the reference head and read by corresponding readout or data loggers. Tunnel construction often employs load cells to obtain more information about loading changes with the aim to improve safety or monitor system performance. Load cells consist of a cylinder of high strength steel with several (typically 4, depending on capacity) strain sensors mounted parallel to the longitudinal axis arranged equidistant around the circumference to measure the compression of the cylinder under load. They are often manufactured with a centre hole to accommodate anchors, rock bolts and tendons. With the multi sensor configuration it is possible to obtain accurate readings under mildly eccentric loading conditions if sensors are read individually. The readings from the individual sensors are averaged and when used in conjunction with a calibration factor (supplied with each cell) to allow the applied load to be calculated. The principle of measurement varies based on the selection of strain sensors (typically electrical resistance or vibrating wire etc). Connection to the load cell is via a heavy duty cable which can be connected to a portable readout or a data logging system. Piezometers are employed to monitor static fluid pressure in soils and rocks or changes in water level. They can deliver long term accuracy, durability and a convenient data acquisition with a wide operating range. The sensors are housed in a stainless steel sealed body and can be put in borehole or pushed into soft ground to measure the groundwater pressure. Pressure gauges operate on different principle such as vibrating wire, fibre optic or pneumatic, in order to convert the pressure to an electrical signal. The piezometers can also be read by corresponding readout units or data logging systems. Hydrostatic levelling cells, or HLC describes a number of sensors that take advantage of the change in head pressure of a water column with depth. By placing a small reservoir above the zone of influence of any ground movements, it is possible to use a pressure sensor to record change in vertical position. A water tube is connected to the reservoir, and another tube to atmospheric pressure to remove its effects. If a cell is moved up or down the pressure will decrease or increase, and from this a direct height measurement can be taken. These sensors can be used to measure heave or settlement automatically via a data logger. The dynamic behaviour of full-scale structures is becoming an increasingly important issue for structural health monitoring (SHM). Ambient vibration testing of full-scale structures is generally performed using piezoelectric sensors or accelerometers. However, these devices are time-consuming to set up, especially hardwiring from the transducer to the data acquisition system. Also, accelerometers do not provide a direct measurement of displacement, which is often of interest for the SHM of a structure in operational conditions. Within this context, the use of innovative non-contact Radar Interferometry provides a solution to the drawbacks of other available systems which require time consuming and sometime challenging installation. The Radar interferometry uses microwave interferometry to deliver a remote static and dynamic monitoring of structures and/ or soil displacements with no contact required. Inaccessible areas commonly found in tunnel structure are an ideal target for the Radar Interferometry system to show its non-contact monitoring capability. It can supply practically continuous deformation maps. It can be used to replace accelerometers, LVDT and other instruments that measure vibration or displacement of tunnel walls and crowns. The radar beam from the system illuminates the entire scenario to be investigated; the radar receiver then measures the reflected signal. 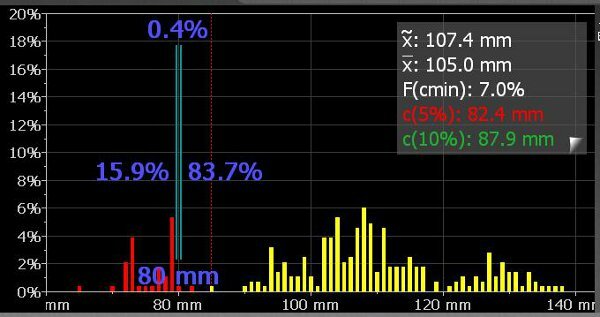 The detection limit is less than 0.01 mm and this great sensitivity in is due to the use of interferometry, measuring the phase differences of the radar waves reflected from each point. The high resolution capacity provided by the radar produces a displacement map showing the displacement of many targets over the entire range. In reality, the radar samples the target displacements, "detecting" even very small changes between scans. If the objective is to sample the displacement of predefined points, passive radar reflectors can be applied to the points of interest if required. VW Total Pressure Cell (tangential/radial) - stress in sprayed concrete lining. VW Strain Gauge - stress in sprayed concrete tunnel lining. Profile Monitoring for Tunnel Concrete Segments or Tape extensometer for measurement of convergence. Since the tunnel is constructed out of individual segments they can be assumed to move in isolation making point monitoring appropriate. Tilt-beams used to measure differential movement installed along the length of the tunnel to determine any differential movements. HLC (Liquid Level Settlement System) to measure different vertical movements. Tilt-meter to measure the roll/twist of tunnel. These movements could be the result of differential movement. VW Crack-meter used to monitor movement at construction joints. Multi-point Extensometer to measure movement of ground surrounding the tunnel. Movement towards the tunnel may indicate potential failure, and large movements may indicate that the tunnel lining is not behaving as designed. VW Piezometer used to monitor the ground water level. Tilt-meter/beams to monitor potential tilt of structures. Differential ground movements may cause the building to “lean” over. Surveying equipment used to monitor movement of various parts of the structure in the x, y, and z directions. HLC (Liquid Level Settlement System) measures any vertical movement of surrounding buildings. VW Piezometers to measure the ground water level. Extensometers for any settlement in the ground underneath the structure. Inclinometer are used to measure lateral movement. If the stability of the ground is compromised it may move laterally which could affect the structural integrity of surrounding buildings. When undertaking tunnelling projects within built up urban environments it is important to monitor a variety of parameters due to the complex and interchangeable nature of the ground conditions. It is increasingly important to have a concise way of collecting and analysing this data. The use of visualisation software with various alarms, triggers and SMS/email alerts is critical to ensure the data is interpreted and acted upon accordingly. Data from the extensometers show some settlement as the tunnel boring machine passes through the area. This results in closer study of the extensometers and tilt/movement of an adjacent building. This would in trigger to compensation grouting to effectively return the ground/building to the previous level. Total Pressure Cells and VW Strain Gauges located in the shotcrete show some increases in stress. This would suggest that the sprayed concrete lining is not providing sufficient support against the surrounding ground and therefore a thick liner must be created. This method of construction is in-line with the “Observational Method” in which design and construction processes can be adjusted according to the data provided from sensors as long as safety is not impinged on (Nicholson et al, 1999). PCTE and BCRC invites Australian counterparts to meet with Larry Olson, owner of Olson Instruments, manufacturer of the most advanced geophysical range of testing equipment in the world for which PCTE are the exclusive distributor in Australia. Mr Olson has over 33 years of consulting experience in the areas of structural condition assessment, geotechnical engineering and conducted or reviewed as principal engineer over 4000 NDT&E projects. Reuben Barnes, our managing director has now returned to his roots and will be heading up the sales for WA from our Perth office.